FRP is an abbreviation for Fiber Reinforced Polymer. FRPs have different applications in the construction industry. The most common use of FRP is the rehabilitation and reinforcement of concrete structures. FRP fibers can increase the strength of concrete by placing and installing them on concrete surfaces such as slabs, beams, columns, concrete walls and concrete foundation. The wide range of fibers applications consist of residential, commercial, offices and industrial buildings, heavy machinery and heavy equipment as well as water and sea structures such as dams and canals. In addition, FRP fibers can be used to repair engineering infrastructure such as road and rail bridges, water and chemical reservoirs, silos, and cooling towers. CFRP is a fibrous filament that is obtained by heating of excellent materials, mainly carbon, in inert gas. The fiber made of carbon is referred to as carbon fiber, which at least contains 90% carbon and is obtained from specially controlled fiber pyrolysis. Black carbon fiber is non-solvent in water and odorless and has a very high resistance to corrosive materials, such as acids and solvents. In unidirectional fiber fabrics, the fiber is parallel to zero-degree orientation, while in bi-directional fabrics, the carbon fiber is placed in two directions, zero and perpendicular to it (90 degrees). Carbon fiber is used in many areas such as building retrofitting, defense industries, automotive, and many other important industries. The fibers used in making carbon fiber (CFRPs) are usually added by resins such as epoxy resin to elements and load carrying members of the structures to improve the shear, bending and torsion capacity of the members. 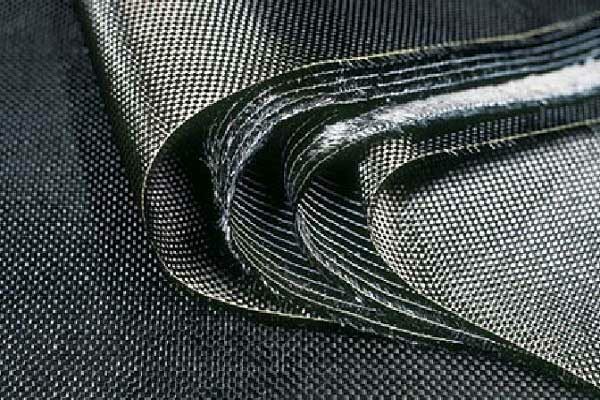 Carbon fiber is one of the mostly used fibers in the retrofitting and composite industry. This type of fiber has the most resilient coefficient of among other type of fibers. The linear thermal expansion coefficient of this fiber is very low at high and low temperatures, which causes the dimensional stability of the carbon fiber at different temperatures. Among the various advantages of carbon fiber, the most prominent one is the ratio of tensile strength to weight (carbon is about one third of the weight of steel and 5 to 10 times that of its resistance). In addition, carbon fibers and fabrics have good resistance to fatigue. The durability and long life against chemicals and impermeability against x-rays is one of the most prominent properties of carbon fiber. Besides, carbon fiber has excellent electrical conductivity. The ease of fabrication of lightweight composite and solid CFRP, and its heat resistance, distinguishes it from other engineering materials. Carbon fiber is an element of density 2,27 g / cm3 and has different crystalline forms. The carbon fiber strand formed from carbon fiber is far thinner than human hair in a diameter between 6 and 10 micrometers. The high price of carbon fiber is due to its high service life and high resistance over time, cost-effectiveness and being economical. Carbon fiber and fabrics are offered in different elasticity modulus and tensile strengths and with unidirectional and bi-directional fiber fabrics by Afzir Company to produce composite materials of various industries and to reinforce various concrete structures. According to the needs of different industries, carbon fibers are offered in a wide range of fiber types from 3K to 50KK, with different weights and widths.